Roger Waters, the man who equated "education" with "thought control" in his pseudo-opera The Wall, is now back and appealing to higher culture in his new opera Ça Ira. Moreover, this is a real opera, with singers, a chorus, and an orchestra with not a single dreamy, overlong electric guitar solo in sight. Fans of Pink Floyd will find little in Ça Ira to satisfy their jones for "the Floyd," although there are many standard musical features associated with the classic rock staple group that have been carried over into this work -- crushingly slow tempi, somber and monotonous singing, and a mania for pristine recordings of sound effects. At one point, a volley of musket fire makes you jump out of your seat. Ça Ira was undertaken with librettists Etienne and Nadine Roda-Gil not long after The Wall, but it took Waters so long to put the finishing touches on it that his collaborators have since died. Waters made a smart decision in using librettists for this project, as his own corroded worldview would certainly have undone the basic idea, the message of which is "there is hope." That said, the Roda-Gils took on too large of a swath of the French Revolution to cram into three acts, and the listener gets no more than a picture postcard sense of its flavor. All of the principal singers in this recording are required to take on multiple roles in Ça Ira, and this results in a twofold effect. The first is that it brings Ça Ira into the realm of opera-oratorio, and even to some degree Brechtian "Lehrstück," and secondly, it's hard to tell what character a singer is supposed to be portraying if one is not following the libretto. Expect the motion picture version soon! However, if the name above the title were Andrew Lloyd Webber, then Ça Ira would be considered better than average. Moreover, there is potential good to be reaped if Ça Ira gains some popularity. If it proves to your standard-issue stoner that you don't have to be a dork to enjoy an opera, that's terrific. If it helps raise the public profile of the fine singers involved here, that is great, too. 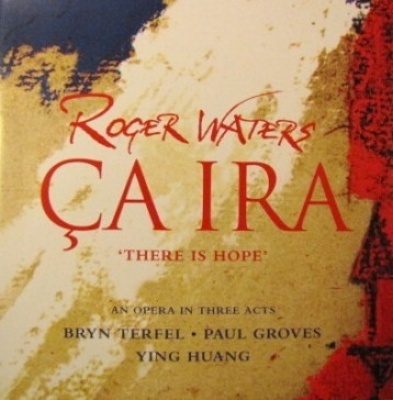 Nevertheless, as an opera of which the notion "there is hope" is the main theme, at least musically Ça Ira isn't very hopeful.